Itchy beards are common to men trying to grow a beard, especially the first time. The itching is an irritation caused by the growing facial hair as it tries to penetrate through your skin. It’s important to follow a routine to make sure you are growing a healthy beard. It’ll also decrease the chances of having an Itchy beard or even allergies that may result in the removal of your hard earned beard! An itchy beard can be a regular problem for the long-bearded guys too. If you are one of those beardsmen… don’t just chop off your beautiful beard! First, identify the causes of the itching and take necessary remedies. So, what are the causes of an Itchy beard and how to get rid of it? Let’s dive in! Why Does The Beard Itch? Well, the itchy beard is seen mostly in those individuals who use shaving equipment such as a razor. Razors usually slice the hair leaving it with a sharp edge, which pierces your skin as the hair grows causing itching. When your beard grow it may cause itching because when the facial hair is cut with a razor, the hair is cut at an angle that leaves them sharp. When the beard grows, the hairs pierce the epidermis before they reach the skin surface. This is the primary reason for Itching Beard or Skin irritation while growing a beard. The lack of hydration cause skin dryness and because of the sharp edges as stated before the irritation or itching increases. Debris is also responsible for the itchy beard. Generally, our beard is exposed to the external environment like wind, dust, sun etc which cause the itching. The dead cells, dust and unhealthy loosening hair all together result in scratching the surface. There are many men who find the charming beard irritating all on a sudden. Are you one of them? Don’t worry too much as it’s a common phenomenon among newly bearded men. It happens at the early stage of the beard growth cycle. Some men experience a little itchiness on the beard while some really hard to bear and then it becomes a problem. This itching beard problem is caused by several factors as discussed earlier. Let’s point out the key causes of itchy beard so that you can prevent this from happening to you in the future. Let’s face it – if you don’t know the main causes of your itchy beard, you can’t solve it! Here are the key factors that lead to itching. Here you can see the growing beard being cut with a razor blade which has caused the sharp angle. 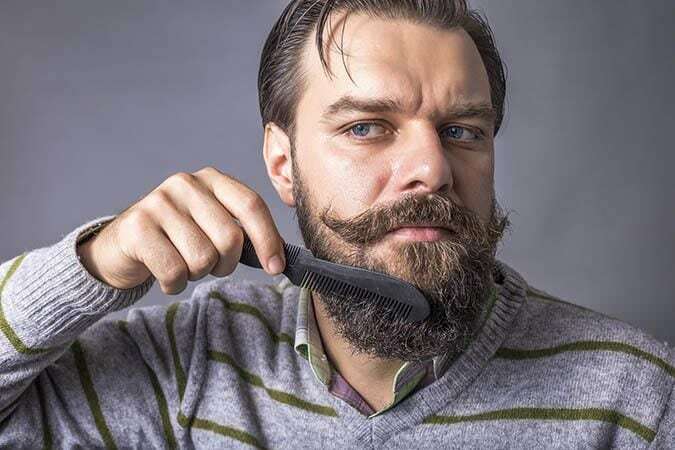 When beards are cut with a razor blade, the facial hair is cut such an angle that irritates the skin when it pierces through the skin surface epidermis. Some hair may result in ingrown hair by growing under the skin and cause serious itching. Some of these are absolutely out of your hand but you can definitely minimize the itchiness by following the treatments discussed later in this post. Dry skin is another cause of itchy beard. The skin can become super dry beneath your beard and cause irritation. Also, there are thousands of sharp ingrown and angled hair being rubbed in that dry skin which multiplies the effect and causes Itching. This lack of hydration can cause beard itching at any stage of your beard growth – from shortest to the longest beard length. Debris like small particles of the dust, dead cells and loose hair can come into the contact of the skin and result in friction which can cause itching. If the beard is not properly sanitized, it can cause dandruff. Then with the help of peeling flakes between the hair, dandruff can cause serious itching to your beard. In many cases, the full beard can cause interlocking of the hair which leads to the itching. This generally happens when a strand of the newly growing beard doesn’t make it out of the skin, rater into the follicle. Over time, this results in the development of an inflammation known as folliculitis. In this case, the surrounding skin turns red and sore. Men with the thickest beard are mostly suffered from this problem. Fungal infection is one of the causes of itchy beard. This generally occurs to men who already have a beard because the skin surface has been prone to accumulate moisture and protect from the sun. How to Treat Itchy Beard? Prevention is always the best form of treatment possible. Wash your beard regularly with quality beard products and maintain good hygiene as the first step to protection. If you have a dry skin, use moisturizers to prevent the itching. If you are facing a serious itching, consult a dermatologist as soon as possible to avoid any unwanted situation. Take medicine and then start prevention after it’s solved to stop itching from reappearing. Soaps which are made for Exfoliating skin – It will help you prevent skin irritation and itching. Remove the dead skin cells (use exfoliator), wash your face regularly to unclog the facial hair follicles to stop ingrown hairs. Beard comb – It will remove the debris and help the beard strands grow in a specific direction. This will minimize the chances of ingrown hairs. Beard lotions – It will soften the irritation/itchy beard. Beard oils and Conditioners – They work like magic for moisturizing the beard. Also prevents skin dryness leaving them soft and helps in reducing the irritation. Shaving shampoo – You can use it every day. It’ll help to keep your beard clean as well as prevent debris and oiliness that causes the itching to the skin. If you use aftershaves, make sure you are using good aftershave. Exfoliation is done to remove the dead cells from the skin. It’s better to exfoliate twice a week. This ensures the deeper cleaning of the pores. If you do the exfoliation routinely, it will also prevent blackheads and pimples! Note: Don’t use the exfoliant made for the ladies, guys! Men’s skin is thick and different than the women… so, always use the product made for the men. Men with a long beard can suffer from itching too! In that case, it is likely that your beard stands are damaged. Also, make sure you are not using any beard product that’s causing the itch! If the tip of the beard root is damaged, your beard will grow slower than before and as it grows will cause skin irritations. Using beard oil or other beard moisturizers, you can help restore the damaged roots and improve the itching condition. Is there are some hair on the skin under your beard? Remove them with the help of sterile forceps. If you stop shaving the beard, the ingrown hair production decreases drastically over time. This is another advantage of growing a beard, right? Combing/brushing your beard have many advantages. Combing makes beard cleaner, removes unwanted dirt, makes it smoother and lined up. By brushing your beard regularly, the facial hair gets a direction to grow. This prevents one of the causes of itchy beard – sharp angled beard growing rebelliously. Hair and beard both have a different structure in both physical and chemical perspectives. So, the procedure of combing your beard is not like your hair combing. Buy a comb made for specifically beard combing. If you wanna use a beard brush – buy one considering the quality. Don’t brush/comb too much. It can cause double ends. Always comb your beard after the bath, it’s the best time to comb/brush. One of the key reasons for most irritation is the usage of old blades which don’t glide as they should have been and causes painful cuts. Don’t use razor blades too many times. Even the best quality razor blades should never be used over 3 times. Then just throw it away in the garbage. New blades can also cause irritation to your skin if your skin is hypersensitive or allergic to the razor blades. If this happens, use the electric razors and you’ll be good. Yes, it’s a little costly but it’s worthy of the price. Try and see yourself. It is recommended to place a towel which is moistened with warm water, over the beard area before you draw the beard. This will prevent irritations because the pores will open by the warm water. The process will be much easier and the sore will be less. Apply a generous layer of foam and shave by using the blade towards the growth of the hair to remove irritations. While passing the blade, one needs to be careful to avoid passing it in the same place more than twice. Regular shaving will irritate the skin and the skin won’t get time to rest. So, it is recommended to shave only once a week. For the hypersensitive or irritated face, prolong the rest for a maximum of time. Since the introduction of the salon as well as the barbershop, maintaining beards has been a walk in the park. However, this does not exonerate you from maintaining your beards. Always wash and moist your beards on a daily basis to enable your hair to grow softly. Otherwise, the itching beard will irritate you in regular interval. Maintaining your beard will ensure a beautifully grown beard without itching, that’s the fact. You will never see any beautifully grown grass without the owner taking good care of the land. Your beard is just like the grass in the example! Because of the beard, you won’t see the facial skin underneath but the skin can be super dry which will cause you scratch too often and end up growing an unhealthy beard. Wash your face regularly so that the dead cells are washed off. Then, if you use quality beard products like beard oil, it’ll take away some unwanted essential oils. So grow the habit of using beard oil and beard moisturizers. It’s a very good habit to wash face in the morning after getting up from sleep and before going to bed for sleep. Use a facial moisturizer (preferred with SPF 50). Sweat and moisture can beget itching of the beard. The humidity leads to the proliferation of fungi and all these things deter the men who are wanting to grow a beard. Essential oils help to fight with itching. Oils like Melaleuca and Lavender that combat dermatitis can be chosen. The curative, antiseptic, anti-inflammatory and analgesic properties of Melaleuca oil help in speedy recovery. Lavender oil, which has the regenerative power, can be used by the men who have a beard still to be done. Because this oil helps to eliminate the itchiness that the short beard can cause. Here is an awesome video on beard itching we recommend. Q. How often should I wash my beard? Ans: One needs to wash his beard every day with the suitable shampoo or soap. And for the dry beard, some conditioners can be applied. After the process, dry the beard completely. Q. What temperature should I wash my beard? Beard Shampoo Wash your beard twice a week. Beard Conditioner You should hydrate the threads after washing. Aftershave Lotions It’ll help you avoid the itching. Shaving Cream Pick the good quality brands. Beard Balm/Oil To keep the beard soft and healthy. Q. Is Itchy beard a common phenomenon? Well, its kind of natural but doesn’t happen to all. It largely depends on your facial hair characteristics. It is thick or thin, spiral or straight etc variants play a vital role whether you feel the itch or NOT. Itchy beards are usually common with African due to the nature of their hair. As a matter of fact, African hair grows spiral; therefore, when shaved deeper, it becomes so difficult for the hair to find its way out of the skin, thus causing irritation. Unlike the Asian and the white, their hair is hard and straight, thus penetrating the skin easily. We know how much the beard itching bothers you during the growth stage. But with these care and treatments, you should have the right recipe to avoid this discomfort and enjoy growing a healthy and beautiful beard.